As an alternative to on-the-shelf textbooks, the idea of custom course materials has been in existence for some time. But interest in custom materials and course packs has catapulted into the mainstream recently in response to rising concerns about the general cost of learning materials, along with the growing demand from faculty for greater flexibility in coursework options to improve academic outcomes. 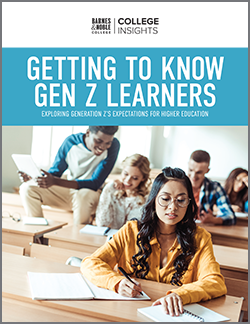 A partnership with XanEdu, Inc., the nation’s leading provider of custom course materials, now brings new technology to help support Barnes & Noble College’s efforts to answer both of these issues. “Our origins were really as a technology company,” explains Brett Costello, XanEdu Inc.’s Senior Vice President, Sales and Marketing, “and XanEdu was created as a way to provide faculty members with access to supplemental learning materials in a digital format.” The company has since grown in tandem with educators’ need to control costs while also providing more customized content to meet and improve learning objectives. Now, by using XanEdu’s platform within FacultyEnlight®, Barnes & Noble College’s innovative online platform that enables faculty to easily research and adopt their learning materials, course textbooks can be created in minutes from an online customization platform, drawing on over eight million individual content items with full copyright privileges. As they build their course material, faculty can have total transparency and control of the cost of the content they choose directly from their FacultyEnlight platform. 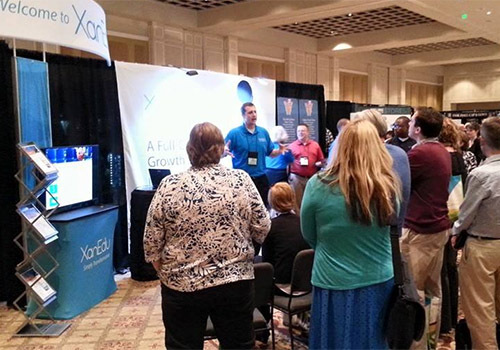 Representatives from XanEdu present at Barnes & Noble College’s Annual Meeting in Orlando, Florida. Costello points out that some instructors are seeking one-on-one support, so a DIY system also needs to be supplemented with full-service. XanEdu’s development editors can also work collaboratively with faculty to create course materials that meet their specific criteria and needs, at prices he says, that can be significantly lower than traditional textbooks. The materials can either be delivered in a traditional printed format or through a school’s LMS on platforms like FacultyEnlight, or directly to laptops, desktops, tablets and mobile devices. Although Costello maintains some 70 percent of faculty include a digital element to their course work, he stresses printed materials are still an important component. 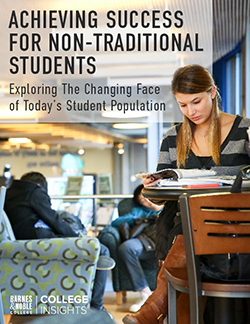 “From the student perspective, there is no difference in how they access their materials — they can obtain them from the college bookstore using programs like financial aid and are consumed just like any other digital content on a computer, tablet or through Yuzu™,” he says. The content can also be shared across devices, enabling collaboration between students to share notes in a group or active study environments. Nicole Guerrieri, Director, Digital Education for Barnes & Noble College, sees another immediate advantage for faculty from the partnership. “It really puts control back in their hands,” she explains. “Our faculty can have complete confidence in selecting content that is reputable, with full copyright clearance, yet individually tailored to their specific class, course and format preference,” she adds.